Boundaries that divide two properties, particularly residential ones, are one of the main causes of disputes between neighbours. When you purchase a property it is critical that your Solicitor clearly identifies where the boundaries to the property are located and who has responsibility for maintaining them. This is a Guide which will set out your rights with regard to boundaries and it will provide you with options as to how to resolve boundary issues before they become a dispute. Where are your boundaries and who should maintain them? Your boundaries will be clearly set out on the Title Plan for your property. Boundaries are always edged in red on the Title Plan. The Land Registry Title Register and Title Plan is a public record and a copy of a Title Register and Title Plan for any registered property in the UK can be obtained for a charge of £6 via the Land Registry’s website – www.gov.uk/government/organisations/land-registry. If your property is not registered then you need to look at the Title Deeds. You may have these in your possession, they may be lodged with your Solicitor your Bank may be holding them on your behalf. There is usually amongst those Deeds documents showing the boundaries of the property clearly marked. If your property is unregistered then we would strongly advise you to consider having the property registered at the Land Registry and we will shortly be releasing a Blog entry to set out your options in relation to registration. To determine who is responsible for the boundaries the first place that you need to look is the Title Register or if the property is not registered you will need to check the Title Deeds. These will often set out which boundaries specifically you are required to maintain. If the Title Register/Deeds are silent in relation to the responsibility for boundaries then the legal position is that the boundaries are party boundaries and as such the responsibility for maintaining the boundaries is shared equally between you and the owner of the property next door who also has use of said boundaries. People often think that they are responsible for the boundary on the left hand side of where they live. This is a myth. There is no legal basis for this assumption. Boundary responsibility is always mentioned in the Deeds and if it is not then they are party boundaries. Often boundaries are not marked out in terms of precise measurements. The Land Registry Title Plans are always to scale. However, you cannot rely upon this as an accurate measurement to determine the boundaries. It is the Land Registry’s position that all boundaries shown on their plans, despite Land Registry plans being Ordnance Survey mapping and to scale, are only considered to be general boundaries and cannot be relied upon as accurate measurements. What do I do if there is an issue with the boundaries? You should never make changes to the position of the boundaries without consulting your neighbour. If a dispute does arise as to the position of the boundaries then the first thing that you should do is consult the Title Plan to your property or if the property is unregistered then the Title Deeds. You may be able to reach an agreement with your neighbour to set out the precise boundaries of both of your respective properties. This is known as a Boundary Agreement and you are encouraged to seek independent legal advice before you enter into such an Agreement. If the boundary between the two properties is a hedge which is then later replaced with a fence the RICS advise that a hedge is always considered to be a general boundary and not a precise one. 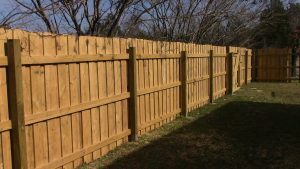 The only way to decide where a replacement fence should be position in such an instance is by agreement between the two parties having use of the boundary. If a dispute does arise between two neighbours then often the way to resolve the matter is by appointing a Chartered Surveyor (qualified by the Royal Institute of Chartered Surveyors – RICS) to draw up a precise boundary plan of both properties. If the parties agree beforehand that what the Surveyor determines will be binding then the Surveyor can set out precise boundaries for both properties which can then be incorporated into a Boundary Agreement. It is possible to apply to the Land Registry to have the exact boundary between your property and your neighbour’s property recorded. This is known as applying for a determined boundary. You can only do this if your property is registered and a determined boundary will remain valid even if you or your neighbour sell your respective properties. If you want to make a determined boundary application then firstly you need a Chartered Surveyor to draw up a plan showing the precise dimensions of your land. The plan needs to be to scale and must contain a North point. You then also need to produce evidence that supports your application i.e. photographs of the boundaries, perhaps a Statement of Truth or a legal Declaration. Supporting evidence can also include copies of the pre-registration Deeds and an Expert Report. You then need to complete a Land Registry form DB whereupon the Land Registry will then consider the precise boundaries that you have presented and decide whether or not to grant you a determined boundary plan. Remember that if either you or your neighbour wish to build on or immediately adjacent to the boundary then you will often have to provide your neighbour with a Party Wall Act 1996 Notice. We can provide further advice on such Notices. Boundary disputes are easily avoided through communication between neighbours. Often disputes arise due to one neighbour moving a boundary or altering the same without the permission of the other party involved. Simple communication can avoid hefty legal fees but if they are necessary hopefully this guide will provide you with some helpful solutions as to how to resolve boundary disputes or avoid them altogether in the future. For more advice on boundary matters please do not hesitate to contact us at abright@alwenajonesbright.co.uk or 01654 711499/01341 281108.